The best type of OP/ED succeeds in two areas other than simply being an enjoyable song: firstly, the song appropriately encapsulates the tone or theme of the series musically; secondly, the animation correlates to and interacts with the music to create an experience unto itself. Hacking to the Gate is a prime example of these qualities. I will now proceed to explicate briefly (oxymoron alert!) with purely non-musical terminology. 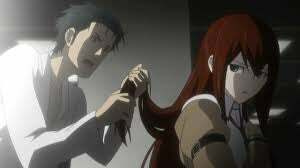 So stick with me, or do yourself a favour and watch Steins; Gate, which is one of the best science-fiction tales and most satisfying love stories in any medium. I swear that statement is not hyperbolic nor influenced by the fact that Steins; Gate is my favourite anime. Most strikingly, the underlying and consistent short, fast beats are timed perfectly to the spinning of the cogs and hands of the clocks, emphasising the urgency of time. More subtly, the electronic beats become progressively distorted (probably thanks to the overlaid electric guitar more than anything else), indicating the increasingly fractured nature of reality and time as the story unfolds. Furthermore, the combination of Ito’s soulful voice and the monochrome palette highlight the tenuous and tumultuous existences of the characters. Particularly during the first verse, where Ito adopts a far quieter tone, the animators chose to use still images of the female leads, in stark contrast to the frenetic animation and crescendo at the end of piece. This prevents distraction from the melancholy of Ito’s voice, but also draws focus to the contemplative stares of the characters. In doing so, it establishes Steins; Gate as a thoughtful character piece. While the OP does effectively tell the entirety of Steins; Gate within those ninety seconds (do not worry, without seeing the series nothing is spoiled), the fact that the animation begins by bringing its characters to the fore shows a true understanding of where the merits of Steins; Gate lie, and assures prospective viewers that they are about to embark on an emotional journey of the highest calibre.